English Hebraist and communal worker; born in Königsberg Oct. 8, 1763; died in London Feb. 9, 1849. He left his native town in his thirteenth year for Berlin, where he attended the Talmudical colleges and met Moses Mendelssohn. 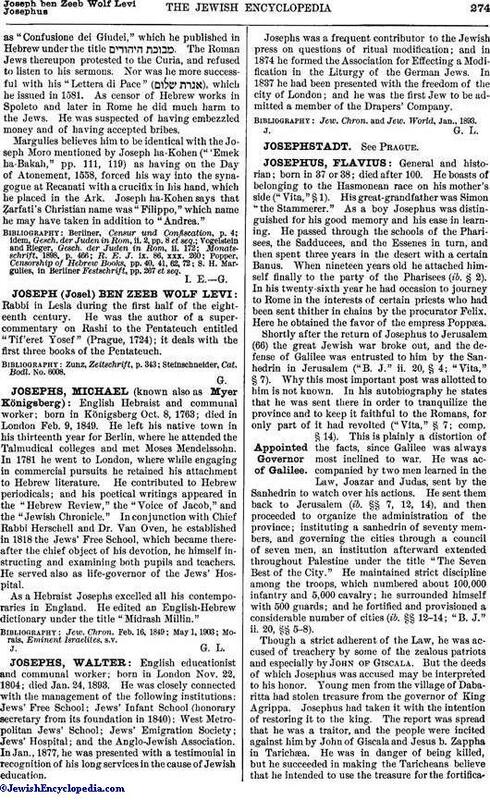 In 1781 he went to London, where while engaging in commercial pursuits he retained his attachment to Hebrew literature. He contributed to Hebrew periodicals; and his poetical writings appeared in the "Hebrew Review," the "Voice of Jacob," and the "Jewish Chronicle." In conjunction with Chief Rabbi Herschell and Dr. Van Oven, he established in 1818 the Jews' Free School, which became thereafter the chief object of his devotion, he himself instructing and examining both pupils and teachers. He served also as life-governor of the Jews' Hospital. As a Hebraist Josephs excelled all his contemporaries in England. He edited an English-Hebrew dictionary under the title "Midrash Millin."